Put together a "Kiss The Cup" party to watch the Stanley Cup Finals. Right after the Blackhawks won the Western Conference, my facebook friend, Ramelle Sarna suggested I do a "Kiss The Cup" party to watch the finals. So, I put together a spread of "hockey" inspired items. The centerpiece are these mini burgers which stack ground sirloin, canadian bacon, spicy ketchup and french fried onions on disks of dark rye bread. The name, The Blackhawk Pucker-Up Slider, is a combination of suggestions from a few other Facebook friends. Wayne shows you how to get ready to go and watch a movie outdoors. Using the 3" cutter, cut circles out of the bread slices. If the bread slices aren't large enough to cut two circles in each, you'll need more than 8 slices. Cut a total of 16 circles and set them aside (to keep them fresh, place them in a sealable container or bag until ready to use). You can put the bread scraps in a food processor to make bread crumbs and put them in a sealable container. These are great sprinkled over macaroni and cheese or other casseroles. Mix together ketchup, BBQ sauce and hot sauce and set aside. Wayne shows you how to make tasty sandwiches sure to impress your guests. Use the 3" cutter again to cut perfect circles in the Canadian bacon (you can use the tiny bit of leftover scraps for omelets or add them to macaroni and cheese as well). Preheat oven to 375 degrees F. In a large bowl, mix together ground sirloin, onions, chili powder, salt and pepper until well combined. Divide mixture into 8 equal portions. Line your baking sheet with a baking pad or aluminum foil. Place the 3 1/2" ring on the baking sheet and press a portion of the mixture into the bottom and sides making sure it's evenly distributed. Carefully remove ring and repeat the process on another section of the baking sheet until you've made 8 patties. Roast the burgers for 13-15 minutes or until they reach your desired doneness (the internal temperature for medium is about 145 degrees F). Remove from oven and dab away any excess grease with a paper towel. Assemble the sliders by placing a circle of Canadian bacon on 8 slices of bread. Top each with a tomato slice, meat patty, dab of ketchup mixture and fried onions. Top the onions with the remaining bread slices and serve. Another item on my buffet are roast beef stuffed baguette slices. 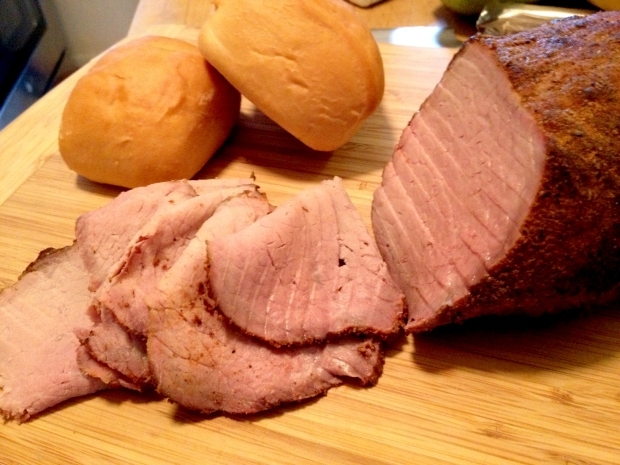 I've shared this recipe in the past using smoked turkey. Simply use the link below and substitute a pound of roast beef from the deli counter for the turkey. Another idea for the buffet came from facebook friend John Sieruta who said "just put anything on ice". So, I've included beer boiled shrimp on ice with a traditional cocktail sauce. I also added a few more touches of my own, including salami sticks from my local butcher served with honey mustard for dipping, bloody marys with special Blackhawk straws, corn salsa and chips, store bought cocoa cremes, which are shaped like hockey pucks, and official Blackhawk decals, stickers, hockey pucks and pennants to decorate the table. Enjoy the finals! If you have any comments or questions, please send me an email at wayne@waynesweekend.com or follow me on Facebook or Twitter.